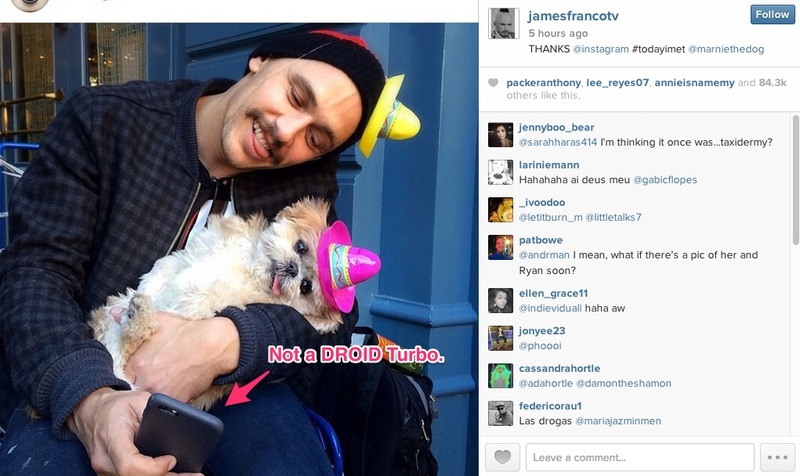 It’s not that James Franco ever said publicly that he signed an exclusive deal with Motorola or Verizon to use a DROID Turbo as his daily phone or be a company spokesperson, but after starring in a couple of teasers for the phone prior to launch followed by another couple of commercials on launch day (which is today, by the way), I can’t imagine that Motorola or Verizon wanted James parading around on Instagram with an iPhone 6. But as you can clearly see in the image above, that’s exactly what happened today. In a series of posts of Franco with Marnie the Dog taken today (he mentioned specifically that they were taken this morning over coffee), one of which was posted by the official Instagram account, we can see that he has an iPhone 6 in hand. Yep, that’s an iPhone 6 in a case. Again, we were never told that Franco would be leading the DROID Turbo charge, but come on, the guy is in all of the commercials for the phone’s brand new campaign, which kicked off today. Oh well, add Franco to the list of other celebrities who get paid handsomely from a phone manufacturer only to turn around moments later and do something on social media with an iPhone (Ellen and Alicia Keys are a couple that come to mind).